– By Sulev Vedler. Tallinn Estonia. Citiscope. What’s less clear on the first anniversary of free transit in Tallinn is whether it has actually changed commuting behavior all that much. But researchers at the Royal Institute of Technology in Sweden who are evaluating the program found more modest results. They calculated an increase in passenger demand of just 3 percent — and attributed most of that gain to other factors, such as service improvements and new priority lanes for buses. 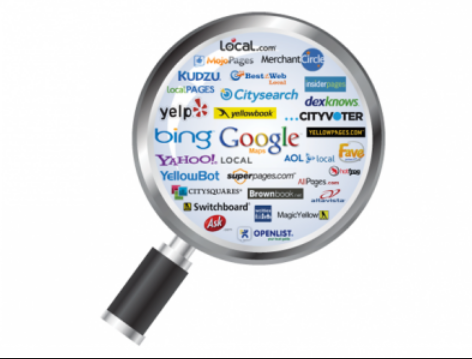 In their analysis, free pricing accounted for increased demand of only 1.2 percent. What’s more, they found that traffic speeds in Tallinn had not changed — a sign that drivers were not shifting over to riding transit as intended. Actually, the researchers said, if any modal shift is happening, it’s that some people are walking less and riding transit more. Their study notes criticisms of free transit as a “second-best pricing scheme” for discouraging automobile use, less effective than increasing the price of parking, gasoline or using the roads. However, the researchers did find evidence of social benefits in the form of improved access to the city. Of all the districts in Tallinn, transit ridership jumped the most in Lasnamäe, a densely populated area with high unemployment and a large ethnic minority population of Russians. In Lasnamäe, transit ridership increased by 10 percent. Tallinn isn’t the first city to experiment with free transit. Across Europe, a number of smaller cities have done it, dating back to the late 1990s. Templin, Germany was one. In France, there was the city of Châteauroux and Aubagne and some surrounding municipalities. Ridership in all of those places increased substantially when fares went away. The most closely watched was Hasselt, Belgium. After Hasselt made its buses free in 1997, ridership increased more than tenfold. Ultimately, that wasn’t sustainable. Facing budget problems last year, Hasselt reintroduced fares of €0.60, although young people, seniors and those receiving public benefits can still ride for free. Targeted free ridership of the sort Hasselt has got now is much more common around the world. Many cities and college towns in the United States have free “circulator” buses on downtown or campus routes. Singapore is experimenting with free train rides early in the morning to relieve crowding during the morning rush hour. And Chengdu, China has offered a mix of all these perks: free rides for seniors, free rides on 44 central bus lines and free rides from 5 am to 7 am. What sets Tallinn’s experiment apart is its size and Tallinn’s status as a European capital. As the birthplace of Skype and online voting, Tallinn also has a reputation for innovation. So there’s a feeling, at least among advocates of the idea, that if free transit can work here, maybe it can work in other large cities. The Social Democrats, an opposition party, first floated the idea of free transit in Tallinn in 2005. It wasn’t taken seriously at first. But later, a former mayor, Hardo Aasmäe, brought up the idea again in a debate in the office of a newspaper. That was noticed by deputy mayor Taavi Aas, who thought it was worth developing further. A 2010 survey of transit riders offered more encouragement: 49 percent of respondents expressed dissatisfaction with fares, more than twice the number who complained about crowding and frequency of service. There was money available to invest. The construction of public water and sewer infrastructure was about to end, so it was possible to finance public transport with funds that previously had gone into construction. The merger of two municipal transit companies, one that ran the buses and the other the trams and trolleybuses, also saved some money. Opponents called the idea stupid. Some said the money would be better spent on building new kindergartens. Others said if there was no charge then homeless people would ride buses all day and make travel uncomfortable for everyone else. The city administration put the question to a referendum conducted among Tallinn residents. Turnout in the election was light, but 76 percent of those who did vote said yes to free public transport. The plan took effect January 1, 2013. Tourists still have to pay €1.60 to ride. But for Tallinn residents, a deposit of €2 gets a smart card that allows limitless travel within the city. Residents do need to swipe the card over a reader when boarding and exiting buses and trams. They also must carry an identification card proving that they are a registered resident of Tallinn. The registered resident part is crucial to how Tallinn is paying for all of this. Before, there were 40,000 unregistered residents of Tallinn, meaning that they lived in the city but were paying taxes to another town where they had previously lived. 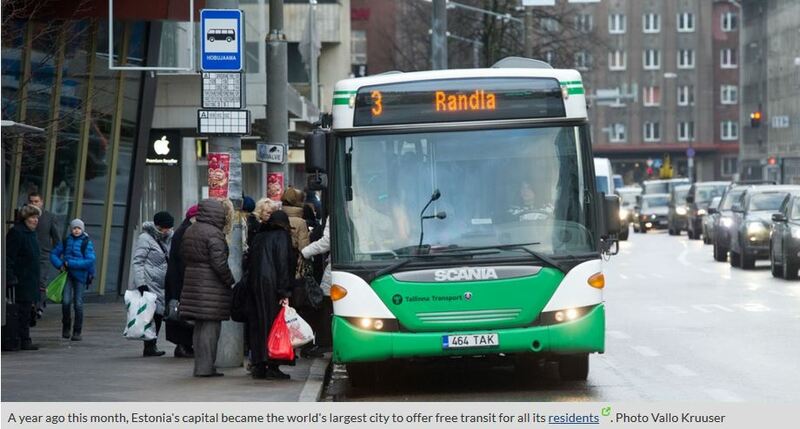 Now, free transit is an incentive for those people to register and get on Tallinn’s tax rolls. Triin Rannar is one of them. She moved from eastern Estonia to Tallinn a year ago, and rides the bus to her job downtown each day. The offer of free transit inspired the 24 year-old to register with her new city. She estimates that she saves €23 per month by registering. Whether that decision was worth it is a question that will take more time to answer. In 2014, researchers hope to gain more insight into free transit’s impact on the local economy. And they hope to get more data on mode shifting, as well as how various socioeconomic groups are responding to the change. Sulev Vedler is deputy editor at Postimees, Estonia’s largest daily newspaper. Previously, Sulev was deputy editor of Eesti Ekspress, Estonia’s weekly newspaper. He studied economics in the University of Tartu. 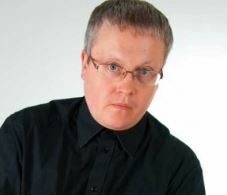 He has been working as a journalist for 20 years and has won different journalistic prizes in Estonia: the best investigative story (2003) and the best feature-story (1998, 2007, 2011). In 2008 he was named the Journalist of the Year. Citiscope is an independent, nonprofit media startup that identifies significant innovations in cities around the world, then commissions locally-based journalists to write quality stories highlighting the new efforts. The reports are designed to serve the architects of the urban future: mayors, councils, city staffs, and cities’ business, civic and neighborhood groups. Citiscope’s weekly innovation story and its CitiSignals rundown on top worldwide city developments are available charge-free at citiscope.org/subscribe. This entry was posted in 2014, Estonia, Local gov't and tagged * Better Choices, *Eco-Instruments, *FreePublicTransit, 2014, China, General Theory, SlowMobilityPrimer, The Eastern Rim. Bookmark the permalink. This is a fascinating article. Thanks, Eric. A 14% decrease in congestion is an awesome achievement. (Yes, I read there are studies showing lower results.) As to how to “pay” for free transit? The first thing officials in Tallinn might do is ask themselves: What is 14% of the total value of our road expansion projects in the last decade? I’m oversimplifying, but those projects may have been unnecessary if free ride had been instituted ten years ago. The same number of people may have been moved around the city by transit instead of car if those funds were shifted to transit. That would reduce the private sector cost of running all those cars around, freeing up personal income, which could be spent on other goods and services. Hopefully more sustainable things than motor vehicle fuel which quickly gets spewed into the atmosphere. You will find useful addiitonal context and discussion of the Tallinn project here: Why The World’s Largest Experiment In Free Public Transportation Failed at http://www.fastcodesign.com/3025761/why-the-worlds-largest-experiment-in-free-public-transportation-failed. You will find some of the reader comments from that piece just below. Poor people gain mobility and freedom of movement. In one of the poorest neigbourhoods ridership was up 10%. Tax evasion was replaced by tax boost Three times as many registrered av citizens of Tallinn because of free public transportation, covering 10 million euro of the costs – rendering free public transportation almost self-financed. Free public transportation turned the tide! For the first time in 20 years, the negative trend of public transportation ridership was turned. 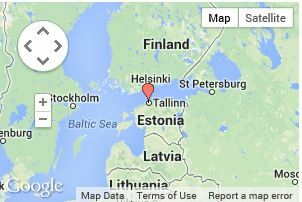 Tallinn is a bad example. A big factor in the lack of increase in passengers is, from experience, most likely related to a lot of people not paying for public transport before it was free anyway. The previous system was set up in a way that you could buy a single use ticket and ride around with it almost indefinitely as long as you never got checked. If you did, you just claim that you forgot to stamp it, they’d stamp it for you, you buy a new ticket and continue until checked again. I myself have only been checked once in 7 years of being in Tallinn – and that was before I actually lived here, so it was fairly easy to ride around for at least a year on one €0.70 ticket (eventually it would fall apart from wear and tear), no problem. Nobody really cared if more people would start using public transport. Why? Simply because that was a genius political move by Mister Saavisaar to comfort the votes from grandmas and Russian speakers from Lasnamae mostly. That worked brillantly and he was re-elected extremely easily! The Swedes used metrics that have nothing to do with the real situation on the ground. •There are no local taxes to speak of. •Income tax makes up ~50% of municipalities’ budget. •Income tax is collected by the government and about half of it is transferred to the municipality where the person was registered to on Dec 31th the previous year. The only goal of free public transportation was to increase the number of people registered to Tallinn to increase tax revenue (with a bonus of appealing to core voters). Tallinn performed gloriously in this regard – the increase in taxes is several million over the cost of making public transportation free. Traffic counts published in the end of December showed that overall number of vehicles crossing at a number of automatic counting points decreased by 0,3% in October-November 2013 compared to the previous year same period. Depending on data interpretation, next to same numbers there is data that shows that compared to 2013 September overall traffic has increased by 1,3% just between September and November as many road constructions were finished by mid-October elections. The big problem with free transit is that it makes it much harder to justify transit improvements or investments, given that increased ridership just results in more taxes and more subsidies. I personally prefer the “user payer” model, where each transport is forced to be self-funded, with little to no subsidy, including highways. The only country in the world that seems to apply this is Japan, where most transit companies are profitable, transit fares are distance-based, but all highways have high tolls and the gas tax is pretty high. So transit mode share is extremely high, because when the user pays for his use of infrastructure and services, the cost advantage of transit is much more evident. And when people have to pay what their transport costs, they tend to stop wanting to sprawl as bad and to favor walkable environments. Free public transit is not a very well thought out idea. User pay would look a lot fairer if there were road pricing. Since there isn’t, roads are overused. Unfortunately most places face problems financing transit – not just expanding it but keeping it running. And people do not place a value on things they get for free. Most free transit experiments have shown that there is very little diversion from driving – and I would suggest that increasing transit mode share is important IF it comes from drivers. Diverting people to transit who currently walk or cycle is retrograde! Fares are not a deterrent to those who currently drive cars, but transit services that are slow, infrequent, unreliable, overcrowded, uncomfortable, difficult to use, inconveniently located are all cited by people who drive as reasons not to use transit. Tackling these issues requires resources – money and road space being the most important. Setting aside road space for transit exclusive use is the single most effective thing to do – especially if space for driving and/or parking is taken away at the same time. Giving up fare revenues means you then have to replace that with something else even less popular!